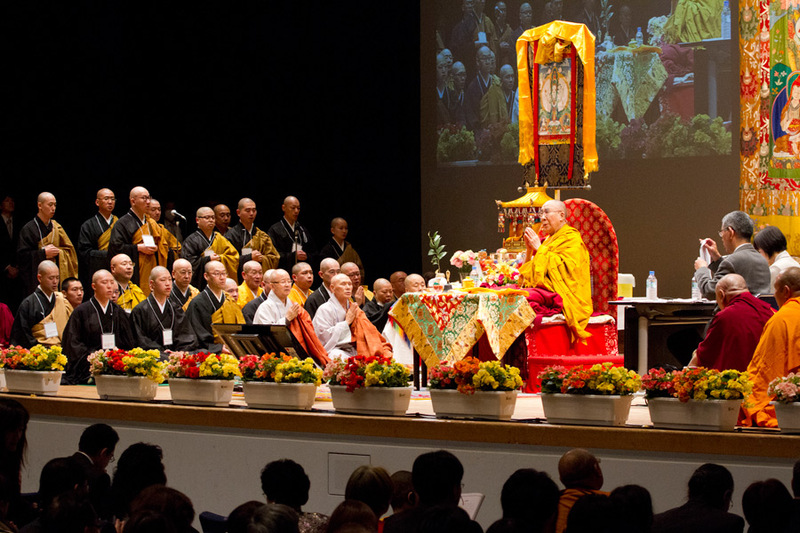 (TibetanReview.net, Apr14, 2015) – Tibet’s exiled spiritual leader, the Dalai Lama, on Apr 12 began a two-day religious teaching to an assorted audience of 2100, which included 370 Koreans, 120 Mongolians and about 1000 Taiwanese as well as some mainland Chinese, besides Japanese, in Tokyo. The venue was the Showa Joshi Women’s University, with the teachings being mainly on the Heart of Wisdom Sutra – which is part of the Perfection of Wisdom texts – and Nagarjuna’s Commentary on Awakening Mind. The teachings began with the Koreans and the Chinese reciting the Heart of Wisdom Sutra one after the other in their own languages on the first day, and with the Japanese doing the same the next day. The second day was devoted to giving of empowerment and permission of Avalokiteshvara, besides giving an explanation of the ‘Three Essential Moments’. The teachings were also broadcast over the internet as well as made available live in 39 cinema halls across Japan. Earlier, on Apr 7, the Dalai Lama travelled from Tokyo to Nagoya where he spoke to an audience of 3,200 students at the Aichi Gakuin University, formerly a Soto Zen training centre. After the speech, he was joined on stage by Journalist Akira Ikegami who mediated questions from the audience. On the following day the Dalai Lama gave a talk in Gifu to mark the 40th anniversary of the All Japan Soto Young Priest Association. While 1600 people filled up the Nagarakawa Convention Center to listen to him, 400 more watched video feed of the event in a nearby room. And, after two restful days with the Busshokai group in Kanazawa, the Dalai Lama, on Apr 11, visited the Souji Temple in Yokahama and gave a public talk to an audience of 1,800. The Dalai Lama has been touring Japan since Apr 2 on his current, 21st visit to the country. He returns to India on Apr 14.